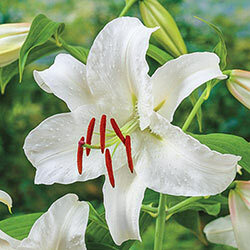 It's easy to see why the Casa Blanca Oriental Lily is a favorite among gardeners and florists. 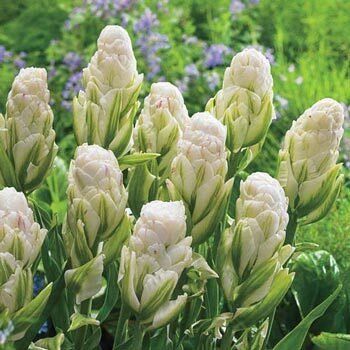 Its dazzling, fragrant 10" blooms are perfect for bridal bouquets and fresh flower arrangements. In the garden, the blooms are eye-catching and they attract butterflies. Because of their large white blooms, Casa Blanca Oriental Lilies are also a favorite for moon gardens. Delicate and fragrant, Oriental lilies are some of the most beautiful lilies to plant in the garden. Their fragrance permeates the summer breeze. Plus, they are easy to grow, delivering spectacular blooms year after year. They bloom later in the season than many other lilies. 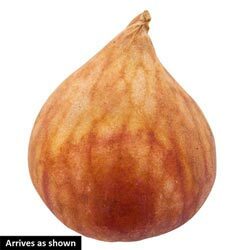 Planting Instructions: Plant 6-8" deep and 5-6" apart. Soil Requirements: Moist well drained fertile soil. Pruning: Only dead heading. It is important to let the foliage mature and die down naturally, do not cut back. Next year's bloom is being developed. When foliage is yellow or dried up.